Descubra los diversos sabores del valle del Rin en este tour de 30 minutos de vino de hielo Boppard. 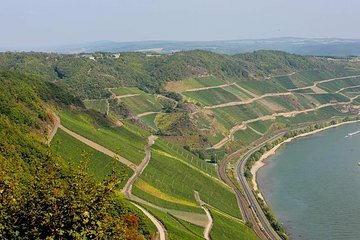 Visite el viñedo Boppard Hamm, el viñedo más grande del valle del Medio Rin y ampliamente considerado como uno de los principales viñedos de la región. Durante su visita, obtenga información sobre el patrimonio vitivinícola de la propiedad y disfrute de las vistas de los viñedos. Conozca los diversos varietales de uva que prosperan en los suelos fértiles y pruebe cuatro vinos diferentes del Valle del Rin junto con dos Reislings locales para apreciar sus diversos sabores. Conozca el rico patrimonio vitícola de la finca. We loved the tour. It was in the town of Boppard on the Rhine about 20 minutes from Koblenz going South. We had never heard of Boppard before and we were delighted to discover this beautiful town. The winery was located just across from the church in the main square. It was closed when we arrived as we were 30 minutes early and because of the season the store is closed on that day unless they have an appointment. We called the telephone and the owner was at the store within 5 minutes. After introducing and getting to know us a bit he proceeded to tell us about the ice wine, I had not heard about ice wine so the talk was very informative and fun. We tried 5 ice wines and other common wines and we talked all the time. He was very friendly and likable and his wife stopped over for a while and was also very friendly. Afterwards we visited the city, had lunch and returned to Koblenz. We will be talking about this unexpected experience for a long time. We will also keep enjoying the ice wine which we are taking home. I highly recommend the tour, the town of Mopard, the owners of the wine store and the wine. A great experience! This was a bit weird. It was more of a tiny liquor store where the kid behind the counter just let you taste what they had for sale on the shelves. We felt so uncomfortable that we only tasted a couple things and left after about 10 minutes. This is an awesome experience. The guy tells us the way to make icewine, the introduction of wine. I really recommend this 30 minutes wine tasting tour. We were the first people to ever sign up for this, so they have some bugs to work out. But Boppard was a devine city and the young lady educating us on ice wine was friendly, well educated on her subject and did a great job! I recommend this to anyone wanting to learn about ice wine. This shop also has a great selection of wines to take home!